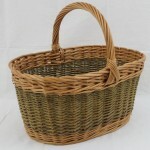 Shopping baskets used to be a familiar sight on the high street of every small town. Now we’re more used to pushing shopping trolleys down the supermarket isle. Still, in these days of the 5p charge for plastic bags, they are making a bit of a comeback. Handy to keep in the car or cupboard when just popping to the local shop for a few items. Below are some of the styles we’ve made – oval, round and rectangular. We make them in various sizes and colours. 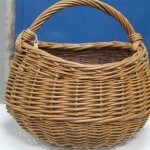 We can also replicate a particular basket – if you have one you adore but it’s beyond repair. Talking of repairs, we can do those too. 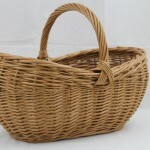 For our friendly, professional advice and to discuss your basket needs, please email or call Alison on 01294 829012. There are several traditional weaves available to the basketmaker. 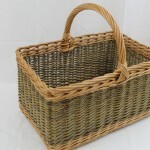 For our shopping baskets, we mainly use randed weave and slewed weave. 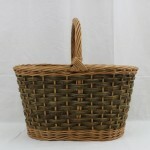 Both weaves make a good durable basket. Randed weave gives a finer finish – slewed weave a more chunky finish. Most of the shopping baskets above are made using randed weave. Only the Ashfield Shopping Basket was made using slewed weave. It’s easier to create that lovely curved shape using randed weave but it takes a bit longer to make a basket using randed weave so they can be a little more expensive. 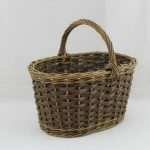 Interestingly slewed weave seems to be the invention of British basketmakers; it’s not often found in baskets made elsewhere (though we haven’t done extensive research). Perhaps when time became money the British basketmaking industry had to find the quickest method of constructing a basket.